Why should you enter the European Enterprise Promotion Awards 2019? With the beginning of a new European Enterprise Promotion Awards (EEPA) cycle, many of you might be wondering if you should take the chance and try to secure your place in the EEPA hall of fame. But why should you enter EEPA? What should you prepare? Promoting Enterprise has collected some advice from previous winners to showcase the best parts of entering EEPA and their advice for prospective candidates. Collect some tips and tricks from our past winners, and don’t forget to watch their winning moments on our YouTube channel! “Any organisation that believes its project has a beneficial impact on promoting entrepreneurship and small business at the national, regional or local level should enter EEPA. It is a great opportunity to make your project known to a wider audience, to have insight into similar ones running across Europe and to be part of a pan-European business promotion environment. Firstly, it is always useful to take, from time to time, an “outside view” on what you do, based on the criteria of the EEPA. Taking part in an EU Award means competing with a lot of other projects – so there is also the chance to learn from others. Secondly, EEPA is a chance for recognition on an EU level. When applying it is important to ask yourself if others can replicate what you do. Success is always a combination of vision, strategy, trial and error, lessons learnt and results, so be sure to include your project story and journey. Finally, prepare well! Be aware that it requires quite a lot of work until your documents are “final” (based on the requirements of the EEPA). Advice and help from the national body (in our case the Federal Ministry of Science, Research and Economy) might also be very useful, so make the most of it. I would recommend working on the tangible results of your projects. Showing that the submitted project has a positive impact on their territory and that it can help other European countries and citizens! Keep coming back to the Promoting Enterprise News Portal for the latest on EEPA 2019 and don’t forget to follow us on Twitter, Facebook and Instagram! The European Enterprise Promotion Awards 2018 may be over, but Promoting Enterprise is back with a series of winner interviews! Today we begin with Category 1: Promoting the Entrepreneurial Spirit, which was won by “Piraeus Blue Entrepreneurship” from Greece. “Piraeus Blue Entrepreneurship” highlights blue entrepreneurship and economy, which cover the sustainable use of the sea and its resources for economic development. The Municipality of Piraeus has implemented several blue entrepreneurship actions including the BlueGrowth innovation competition, the BLUACT network, the Blue Development Strategy, two European programs and the Entrepreneurial and Innovation Centre for Blue Development. The goal is to create new sustainable businesses and jobs in the Blue Economy and to promote a new innovative business ecosystem. So far the project has produced 20 new startups, 45 new jobs and 55 networking events. The Municipality of Piraeus first heard about the EEPA national competition in February 2017 through a call launched by the Greek Ministry of Economy & Development (General Secretariat of Industry) as EEPA National Coordinator. At the time, the Piraeus Municipality chose not to compete and instead take the time to strengthen and document our candidacy in order to win the 2018 award, which is exactly what happened! Every application of this kind should focus on the project’s goals, team, timing, and deliverables—and telling the story of the project correctly requires detailed planning and management. When preparing an application it is important to present the project scope and clearly define the objectives and steps, which is what we did throughout our preparation process. In addition the experienced and highly committed employees of Piraeus Municipality who planned and implemented the “blue projects” helped the candidature preparation team, which was extremely helpful and insightful. It was an incredible honour to be awarded an EEPA prize. We also felt that our carefully planned efforts over the last few years to bring out Piraeus as one of the first cities promoting new and sustainable jobs through investing in the blue economy has now been widely acknowledged. This acknowledgment has made us even more confident and increased our dedication to continue our blue growth development strategy. The most obvious part for us was the satisfaction of knowing that we are on the right path regarding our local development policy for the creation of new competitive and sustainable jobs in local level. The EEPA jury is well-known and reputable as an awarding body and thus winning an EEPA gave special credit to our efforts and recognition for the work our team have been doing. In addition, winning the award is an opportunity to take the time to look at what we have achieved, and where we want to take our blue growth policy in the future. It is a chance to take a step back and see how much we have accomplished and how we will motivate our municipality team to carry on working towards the future. Any organisation that believes its project has a beneficial impact on promoting entrepreneurship and small business at the national, regional or local level should enter EEPA. It is a great opportunity to make your project known to a wider audience, to have insight into similar ones running across Europe and to be part of a pan-European business promotion environment. EEPA 2019 candidates should extensively document their activities, carefully assess the effectiveness, sustainability and impact of their initiatives, and present concrete, measurable and usable results. The potential of transferring the project to other regions in Europe is an important asset too. Overall, do not hesitate to participate in EEPA if you have a significant entrepreneurship promotion practice to share. The first one involves the adaptation and effective transfer (re-use) of our Blue Growth Initiative (BGI) to other economic environments and countries through URBACT Programme. BGI helps young entrepreneurs realise innovative concepts and create jobs in Blue Economy. To this end we formed the BluAct transnational Transfer Network, the added value of which is to introduce and mainstream the BGI in the policy setting context of other seven European cities. Our goal is to expand and consolidate the BluAct network in the next two years. Blue Growth Digital Innovation HUB (BG-DIH) aims to provide information, education and training services through the use of advanced technological equipment. It also seeks to promote experimentation in the production of innovative products and services by pupils, students and young people – potential entrepreneurs in the Blue Economy sector. BG-DIH is in the preparation phase and will be fully operational in spring 2019. The 12th edition of the European Enterprise Promotion Awards (EEPA) is now over, and after months of waiting we now know which projects were crowned best in Europe. Congratulations to all of the winners in the EEPA ‘Class of 2018’, your hard work has paid off! Have a look below to find out more about this year’s winners, and click on each project to see their video presentation from the SME Assembly 2018 in Graz, Austria. Stay tuned for the publication of the 2018 Compendium of winners brochure (in English) to find out more about this year’s winning projects, and don’t forget to have a look at the EEPA 2018 ceremony photos here. Keep following right here on the Portal and across social media (Twitter and Facebook) for winner interviews and updates. It’s time to meet the shortlist! Last week we announced the official EEPA 2018 European shortlist, and starting from this week we will be introducing each of the nominated projects, here on Promoting Enterprise. Today we begin with Category 1: Promoting the Entrepreneurial Spirit. This year we have projects from Belgium, Estonia and Greece competing for the prize. Find out more about who is competing for the European title in Graz this year. The Makersrepubliek brings together three initiatives, Handmade in Brugge, TURBO and The Box Brugge. With a shared physical space, the initiatives reinforce each other and encourage cross-fertilisation of ideas to achieve the overall objective of stimulating entrepreneurship in Brugge. The project specifically targets young people and women and has become a pioneering springboard for the city’s economy. Brugge is known for pioneering craftsmanship and through this initiative wants to bring traditional and innovative practices together to encourage businesses to consider the city as an attractive location, with innovative facilities like the ‘plug&play’ business premises offered in the inner city. Superheroes is an entrepreneurship and leadership accelerator dedicated to unlocking the potential of 13-17 year old girls. Over the course of four months and 10 workshops, participating girls test their strengths, boost their life skills and develop bonds with each other. Most importantly, they turn their dreams into reality by running projects they are passionate about in teams of five, supported by mentors. A unique methodology combined with a daring and engaging set of activities empowers girls to become more independent and entrepreneurial, and to be inspired by diverse role models across the globe. This project highlights blue entrepreneurship and economy, which cover the sustainable use of the sea and its resources for economic development. The Municipality of Piraeus has implemented several blue entrepreneurship actions including the BlueGrowth innovation competition, the BLUACT network, the Blue Development Strategy, two European programs and the Entrepreneurial and Innovation Centre for Blue Development. The goal is to create new sustainable businesses and jobs in the Blue Economy and to promote a new innovative business ecosystem. So far the project has produced 20 new startups, 45 new jobs and 55 networking events. The 2018 EEPA shortlist has been finalised. After a successful EEPA 2018 jury meeting on 26 September, the jury made their selection from all of the national candidates to choose the top projects in each category. Congratulations to all of the selected projects and see you at the EEPA finals this November in Graz, Austria! Today marks the introduction of the final EEPA category, “Responsible and Inclusive Entrepreneurship”. This category recognises initiatives that promote corporate social responsibility among small and medium-sized enterprises and entrepreneurship among disadvantaged groups such as the unemployed, legal migrants, disabled, or people from ethnic minorities. Come back to Promoting Enterprise every week to discover the national winners across the other five EEPA categories: Promoting the entrepreneurial spirit, Investing in Entrepreneurial Skills, Improving the business environment, Supporting the internationalisation of business and Supporting the Development of Green Markets and Resource Efficiency. The “Promoting the entrepreneurial spirit” category has once again proved to be the most popular category, receiving 14 entries for the 2018 edition. This category recognises initiatives that promote an entrepreneurial mind-set, especially among young people and women. Have a look at the winning national projects below and stay tuned to find out which of them will make it on to this year’s EEPA shortlist after the jury meeting in late September 2018. Come back to Promoting Enterprise every week to find out about the national winners across the other five EEPA categories: Investing in entrepreneurial skills, Improving the business environment, Supporting the internationalisation of business, Supporting the development of green markets and resource efficiency and Responsible and inclusive entrepreneurship. 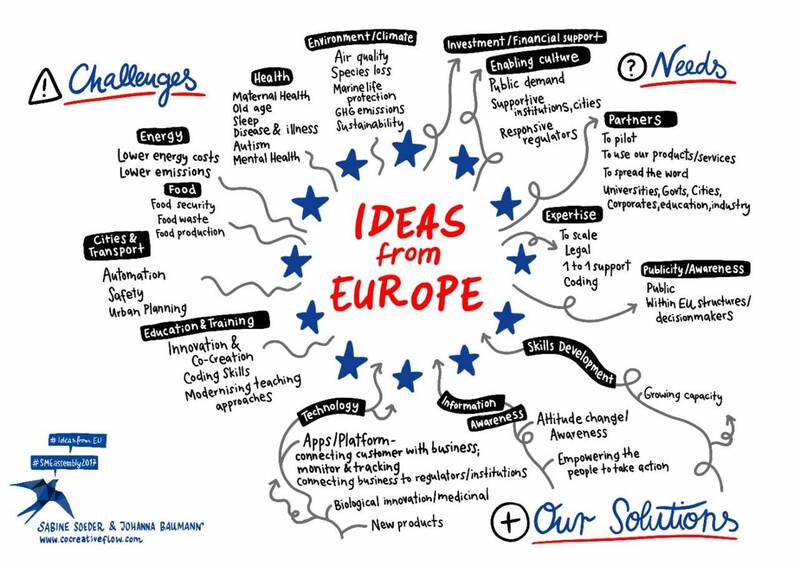 Have you voted for your favourite Ideas from Europe wildcard candidate yet? Read on for a re-cap of all the wildcard candidates and be sure to make your voice heard before voting closes to get your candidate to the finals on 24 April in the Hague later this year. The Syndeseas Integrated Solution is an innovative tool, managed by a team of Shipping MRV Auditors. The tool is designed to support and facilitate the enhanced implementation of new and existing maritime regulations as well as help reduce emissions and the use of fossil fuels. eCars.bg makes electric mobility easy to understand, desirable and accessible. They produce and distribute EV charging stations, as well as own the largest online media for electric mobility in Bulgaria. In addition they spread their message through the production of a unique TV series featuring Bulgarian celebrities. Balmaris uses a system to filter ballast water without the use of chemicals. This reduces the damaging effects of invasive alien species introduced via ballast water that are recorded in the seas all over the world and that are having considerable economic, ecological, and environmental impacts. Sens Foods is looking to use insects to create a whole new range of sustainable, next-gen food products. Using cricket flour, they have developed unique protein and energy bars – gluten and lactose free, with the highest quality protein from crickets and premium natural ingredients. Sol Navitas provides living quarters with natural fresh air with the help of solar energy. As a result global air is less polluted because the technology only uses existing solar energy that does not emit CO2 into the atmosphere. We spend a third of our lives sleeping, yet most people still know relatively little about sleep and its implications for our bodies. With Dreem, the breakthrough wearable technology that improves deep sleep quality, Rythm not only studies our sleep behaviour but actively enhances our deep sleep. Centaur are passionate about food safety and enabling abundance. Created by an agronomy expert and software engineer, Centaur brings intelligent technology to history’s oldest industry, by keeping crops healthy and the world happily fed. To be engaged and to be creative, people need unusual triggers to create breakthroughs. Be-Novative invites corporate and individual users to a virtual brainstorming during which participants can find solutions to the world’s big problems or for everyday life situations, using the power of creativity and community. We spend nearly five years of our lives coughing and having clogged noses. The Panoxyvir spray is based on molecules produced by our body that have the ability to modify cell membrane composition, which can be used to cure colds and prevent the onset of symptoms. Alternative Plants is a biotech start-up that develops plant stem cell cultures for sustainable production of botanical ingredients. Plant stem cell technology is our tool to make inaccessible ingredients from rare medicinal plants accessible to all. Friends Jam is an organisation that connects big families with gardeners or arboretum owners. Together they collect the surplus berries and fruits from the year’s harvest. These are then used to either complement the existing food budget for a large family (allowing them to save for other items), or are made into jams which the families can then sell for extra money. Easy Peasy Coding uses technology to make children think. Their programs include after-school and joint parent/child classes. The initiative also trains teachers, and provides schools with classroom-ready resources like student workbooks, as well as guidance on how to link coding to core curriculum subjects. SEEDiA creates products that gather solar energy. Their solar benches, stands and other products utilise the energy they gather to charge mobile devices (both with USB ports and wireless chargers), Wi-Fi hotspots, heated seats, radio, LEDs and screens. ENTy aims to empower Ear-Nose-Throat-doctors to issue data-based assessments. The solution consists in a lighter, portable, lower cost device that generates numerical indicators which are easy to interpret. Every student of medicine has to pass an anatomy exam, which is considered to be one of the toughest. Virtual Medicine has the following mission: simplified and effective learning of anatomy. This was the reason for which they created the first virtual anatomical classroom, in which students are learning about anatomy using virtual reality. Urban planning methods are completely obsolete and are practically the same as they were 100 years ago. That’s why AgiliCity is developing an innovative solution that moves urban planning to industry 4.0 standards, making it a lot smarter, more flexible and transparent. Auto Drive Solutions (ADS) is specialised in the precise guidance and positioning of trains, automobiles and other vehicles. ADS develops innovative and disruptive positioning systems and developed a first prototype that has been successfully tested on the Madrid Metro. In the UK, 3 million people juggle paid work with caring responsibilities for the elderly. Howz brings peace of mind, by monitoring the elderly’s use of everyday objects, learning what’s normal and alerting the family when things look out of the ordinary. The end of 2017 draws nearer, so what better time to look back on the exciting year we are soon to leave behind us! The Promoting Enterprise News Portal has been lucky enough to host several guest contributors, high profile interviews from the worlds of innovation and entrepreneurship, and of course be the ‘one stop shop’ for all European Enterprise Promotion Awards (EEPA) related content, amongst other topics. We began the year by getting ready for the launch of EEPA 2017, looking back on the EEPA 2016 winners and finding out what the attendees of the SME Assembly 2016 thought about their time in Slovakia. The year continued on with the exciting launch of the 2017 edition of EEPA, during which we presented the shortlisted projects who went on to compete for European prizes. The standard of projects was extremely high and we would like to thank all of the National Coordinators for their hard work and dedication to their national campaigns. The Youth Essay Competition also came back to Promoting Enterprise for a second edition, which attracted over triple the number of entries than last year. With many high quality entries coming from across Europe, and even beyond, the 2017 essay competition jury had a tough time choosing just three finalists for the shortlist. The finalists, Evlampia Karavangeli from Greece, Pavle Kostić from Serbia and Oksana Vedmidska from Ukraine, all impressed the jury with their answers to ‘What skills do tomorrow’s entrepreneurs need?’, which they went on to present at the biggest event of the year…the SME Assembly 2017. After a live audience vote, Oksana Vedmidska was chosen as this year’s winner. This year’s SME Assembly was held in Tallinn, Estonia from 22-24 November 2017 and focused on encouraging us all to start, scale and spread our wings. If you missed it, read our daily posts (Day 1, Day 2, Day 3), have a look at our Instagram and watch the highlights video for coverage of this European flagship event for entrepreneurs, facilitators and innovative thinkers. There is also an SME Assembly conclusions post discussing the main results from Tallinn. 2017 has been a busy year with exciting developments, news, competitions and events. The Assembly continues to grow, European SME Week continues to excel and innovators continue to share their thoughts with us here on Promoting Enterprise. As we close a busy year, the whole Promoting Enterprise team would like to thank you for your support throughout 2017, we hope you enjoyed our posts and will continue to bring you more next year in 2018. Youth Essay Competition 2017 – Who is going to Tallinn? The Youth Essay Competition results are in! After a lot of deliberation and discussion, the Jury have selected their top three submissions who will go on to compete for first place at the SME Assembly 2017 in Tallinn! Evlampia Karavangeli is 22 and from the small town of Drama in northern Greece. She is currently studying at the Democritus University of Thrace Medical School and is very enthusiastic about her studies. She is multilingual and speaks Greek, English and German and is also studying Spanish, which she combines with her love for sketching and literature. Find out what her essay ‘Checkmate in Entrepreneurship’ is all about when she presents it live at the SME Assembly 2017 next month! Oksana Vedmidska is from the small town of Pryluky, not far the Ukrainian capital of Kyiv. After finishing her studies in Technical Translation, she went on to work as a translator of medical texts, working in English, German and Russian. She then went on to win a scholarship that took her to Germany to study a Masters in the areas of dubbing, subtitling, audio descriptions for the blind, and easy language. Earlier this year she was also selected to represent her home country of Ukraine at the UN General Assembly in New York as a winner of the 2017 edition of the Many Languages One World competition. What skills does Oksana think an entrepreneur needs? And why does she think “entrepreneurship is one of the most effective tools, which our global society has to transform the world into a better place”? We will find out during her live presentation in Tallinn in November! Pavle Kostic is from Nova Pazova in Serbia and is currently in the third year of his Management studies at the University of Belgrade. He has been actively involved in several art, essay, photography and debate competitions, including the Serbian competition for ‘Best business ethics essay’ which he won in 2014. What can we expect from Pavle’s essay ‘Ethics and a system as a prerequisite of regular competition’? Find out next month at the SME Assembly when he presents it live!